This is my review of the Tefal Pro Express GV8930 steam generator iron. With over 200 online buyer reviews this one gets an average buyer satisfaction rating of 88% which is a super rating by any measurement. It is not a cheap option with an average buying price of around £180 depending on exactly where you buy it. 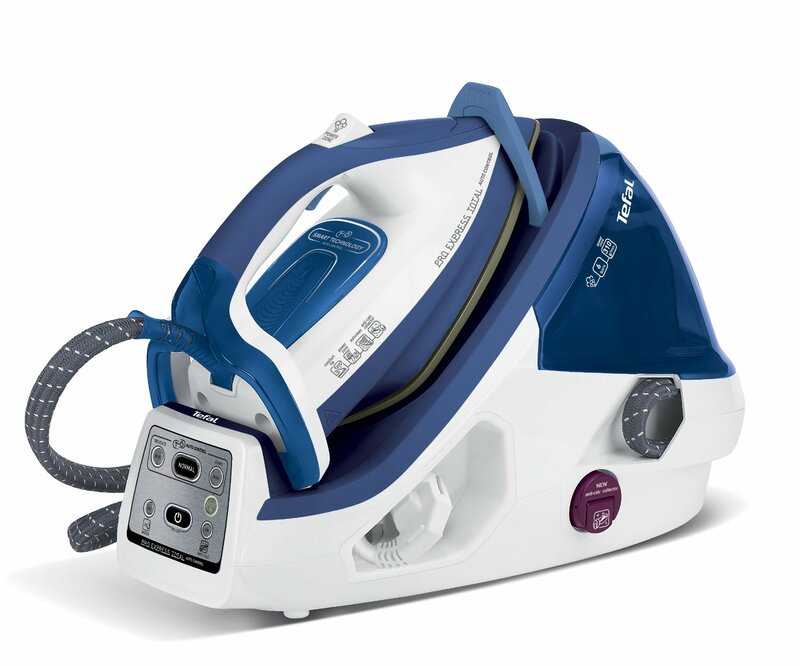 The Tefal GV8930 Pro Express Total Steam Generator Iron is one of the Tefal branded high end products and has 3 different steaming levels that covers a range of garments from delicate all they way through to materials like jeans. It has 6 bars which offers superb steam penetration with up to 310g/minute of steam delivery which can deal with any type of creases. Like all Tefal irons it comes with a diamond soleplate known as the Ultraglide. This ensures that there will be no catching or damaging of clothes simple because of this smoother plate. Like any steam irons of this nature and quality, the technology is designed to make sure that you have exactly the right amount of steam delivered to the garment at the right time. It also ensures that there is no risk of burning garments as you will always have the right setting and the right amount of steam. This iron has some high specification features as standard. We particularly liked this feature as all dials and temperature gauges have been removed and have been replaced with a simple one touch button system. The 3 settings are normal, jeans and delicate, so depending on what fabric you are ironing you just select the appropriate setting and the Tefal GV8930 adjusts the temperature and output of steam accordingly. The higher a bar pressure you see on an iron, then the more powerful delivery of steam you can achieve. This model is right at the top of that range. it has as standard 120g/minute of normal steam flow through, which is more than enough for what would be termed or classed as normal ironing. Then, when you need to deal with the tougher creases, such as those you would find in jeans, then you simply give it a shot of the 310g/minute and watch that go into action. You get a huge 1.8 litre water tank which means fewer trips to the sink and allows you to get your ironing done quickly without having to continually fill up the tank. On average you get around 2 hours ironing time from on full tank of water. The tanks is easy to remove and replace and simply makes your life that little bit easier. We do like the way that Tefal irons in general operate when it comes to removing build ups of scale on the iron. They have a little spoon shaped structure at the bottom of the iron, which you pull out and remove. You simply then need to tap out any build up of scale, and replace it. Gone are the days of anti-scaling tablets and such like. Many of these styles of steam generator irons are really bulky and quite difficult to store away easily. This model uses a safety lock along with a nice wide heel and between those two features, you get both stability when stored upright, and also fairly compact. There is a built-in storage compartment for both the electrical cord and the steam hose. As you can see from the image on the right, the iron locks safely into the main unit, so as when you come to move it to its place of storage, the entire unit comes together so no danger of the iron coming away from the unit or falling over. Overall we really like this GV 8930 model as it is very high quality and extremely well made. It is like the GV9461 in many ways but has a couple of extra features which makes it slightly better, though slightly more expensive as well. Most buyers stated that they could get through their ironing in around a third of the time as it took them before. There was no messing around as this iron got through wrinkles as if they were not there. Online buyers also said that this model was very easy to use. Many buyers said that this model was really good for ironing cotton bed linen. I am sure you know the amount of wrinkles in those. I also understand that not everyone likes to iron their sheets, but for me there is nothing quite like jumping into bed, with crisp cotton sheets properly ironed. If you have men in your home then buyers said this one did a great job on shirts. They also said they could get great sharp creases into tailored trousers without leaving any shine. So as you can see, this one gets some really impressive reviews and we would add to those. The GV8930 is right up there with any of the best on the market. We always tend to look at all the reviews when we review an actual product. The reason we do that is because we want to get an overall impression of it. People who buy products tend to always tell the truth about their experience. Almost always you will find a few negative reviews of people who have had a genuine bad experience. We found 3 poor reviews on this one and all three said that it spit water out and actually wet the clothes. What we would recommend in cases like this is to immediately return any product which does not work as it is intended to do. For the huge majority of people who have bought and used this iron, they have all had really good experiences, so overall we would have no hesitation in recommending this one from Tefal. All 3 people who complained about this returned the item and got a refund and I guess you can’t ask for much more than that. We tested this product for a month and did not encounter any issues at all. We particularly like the large tank, the simple storage system and most of all we like the easy settings that come on this iron. It completes a large amount of ironing in a very short space of time and that is the beauty of all steam generating irons.